* These races were regarded as the Classics. ( Mick won four Classics ) Though the Welsh Derby win of 1930 would nowadays also be considered a Classic. Mick also won 10 Matches (one-on-ones) against other leading greyhounds of the day for which he won substantial rewards. For eg the Match on 14th Nov 1930 against Bishops Dream earned Mick £1,100 and a gold cup. 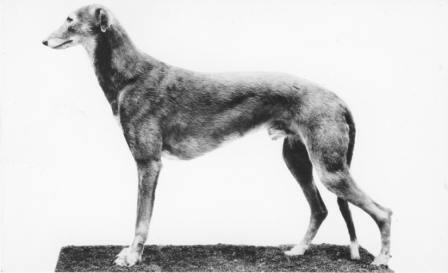 Mick is one of only four dogs to have won the English Greyhound Derby twice (1929,1930). He was the first to do so - a feat that wasn`t equalled until 1972/73. He was also the first dog to win 19 consecutive races - a feat that wasn`t equalled until 1974. He was the first dog to win the English Greyhound Derby and the Greyhound St Leger. This feat wasn`t equalled until 1971. Mick ran 68 track races (20 in Ireland and 48 in UK). He won 51 of those races (15 in Ireland and 36 in UK). He was the first greyhound to run 525 yards in under 30 seconds. Mick set six World Records (525 yards three times, 550 yards once and 600 yards twice). He also equalled or set several Track Records. In total he won 24 racing trophies. 18 were silver and 6 were gold. And over £9,000 in prize money, a fortune at the time. a truly remarkable level of consistency.